Un monde à part! Totalement unique! À couper le souffle, de Hideaway spécial Palmas del Mar. Beau 3 pièces, 3 1/2 salle de bains face à la mer des Caraïbes. À quelques pas de la plage de sable, presque privé, plage naturelle et la piscine. Vous séjournerez à quelques pas du sable. Comme vous profiter de votre café du matin sur votre terrasse privée ouverte ou un balcon privé, vous belvédère surplombant la mer étincelante et entendez clapotis des vagues doucement sur la plage. Entièrement équipé et décoré avec goût. Chambre King Taille du Maître, Queen Size Chambre principale, deux lits jumeaux dans Chambre. Laveuse et sécheuse, ventilateurs de plafond, Lave-vaisselle, micro-ondes, réfrigérateur, cuisinière, air climatisé central, télévision câblée, Draps et serviettes, les lecteurs DVD, stéréo, garde de sécurité sur 24 heures Duty., Contrôle d'accès, Offstreet privée et Gated Parking. Chaque salle de bain a été récemment rénové. Loved the accommodations and location! We’ll be back. 37 Crescent Cove was a great place to stay for our vacation (2 adults, 2 teens). All floors of the villa have a view to the ocean and pool and you can hear the surf easily from the villa. It’s about a 3 - 4 min walk to the beach. The beach was never crowded while we were there, in fact we had it practically to ourselves most days. Some folks have mentioned the waves as being big. For those who want calmer swimming you can walk a couple hundred meters up the beach to a nice area protected by a reef from the surf and enjoy calm swimming. We thought the beach was great. FYI - you can’t go on the beach after sunset (around 7) because it’s a sea turtle nesting area. No big deal for us as we were usually getting dinner after sunset. The villa has everything you need; full kitchen with plenty of cookware, plates, glasses, etc. It also has some pool noodles, 4 beach chairs, a boogie board and 5 very nice beach towels. Plenty of clean towels, hand towels, face clothes, and kitchen towels. The villa was very clean, each bedroom has a bathroom and there’s a bathroom on level 1 which is convenient. Tvs in each bedroom and on the 1st level. There is a propane and a charcoal grill on the 1st level deck/patio. AC worked great when needed. There are restraurants and a small grocery on the Palmas Del Mar resort. We did our grocery shopping at Ralph’s in Humacao which also has a Walmart supercenter and is only a few minutes from the resort. The small market on the resort is great for forgotten items, beer, wine, etcetera. We thoroughly enjoyed Puerto Rico and the villa is in a great location. Check it out! We rented this villa for 1 week with our 2 kids (8 and 11) and my in laws. The villa was immaculate when we arrived with water for each of us in the fridge and supplies in the cupboard to make spaghetti in case we weren't able to stop. The kitchen is fully stocked with everything you could possibly need (pots, pans, utensils, etc.). The villa itself was very comfortable with plenty of room for everyone to have their own space. Each bedroom has its own bathroom and there is a half bath on the main floor. The views of the ocean were gorgeous from the villa. The pool is just a quick walk from the villa and the ocean is just beyond that which kept our kids entertained the entire stay when we were at the villa. The pool area has a lot of chairs both in the sun and under a shaded structure. The beach did have some seaweed washed up onto shore but the water was warm and clean to swim in. A 10 minute walk down the beach will take you to a plaza with a grocery store, shops, and restaurants. Gorge was very responsive and made sure that our stay was the best it could be! We will be returning! Hope you had a safe and good trip back home. Thanks for your kind words and thanks for taking such good care of my villa. I am glad you had a wonderful time in Beautiful Palmas del Mar. You are welcome back any time. Just let me know. We had a great time at Jorge's Villa in Palmas del Mar. The villa is nicely decorated, modern and updated. It is equipped with everything that you need. I would just suggest to Jorge to add a beach umbrella and a cooler. 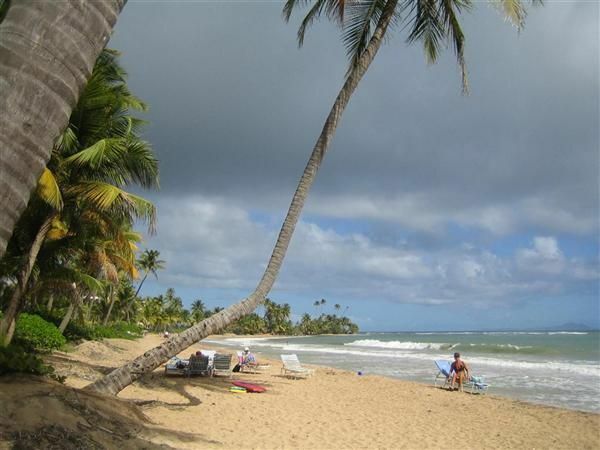 Thanks for your kind words and choosing my property for your family vacation in Beautiful Palmas del Mar, Humacao, Puerto Rico. Great to hear you had a great time. Thanks for taking such good care of my villa. You are welcome back any time. Just let me know. Six of us stayed in Jorge's beautiful Villa for a week. The place is greatly located with a view of a beautiful pool and the beach on the back ground. The Villa was clean, modern and nicely furnished. Air conditioning, appliances, wi-fi, blue tooth speakers, TV, everything was in working order. The view from the terrace was amazing, specially at dusk and dawn. The ability to BBQ or cook your meals in a fully stocked kitchen was great. The resort is beautiful, great restaurants, golf courses and plenty going on to satisfy anybody. Check out the Beach Bohio at walking distance from the Villa for great piña coladas and casual dining. Whether you're active or simply want to relax, this is a great place to spend your Vacation. Jorge was a first class kind of guy working with and during our stay. We definitely will be returning to sequel the great experience and highly recommend this Villa to provide the comfort of a great vacation. I am really happy to hear you really liked our / your place and had a wonderful time in Beautiful Palmas del Mar Beach Resort. I hope you brought back to your home wonderful, unforgettable memories. You are welcomed back anytime to Crescent Cove. Thank you for taking such good care of our villa. Please call me when you decide to come back and visit us. Wow... where could I start? Jorge, the property owner made our dream vacation a memorable moment that will last in our family's records for a long time. His attentions, service and property was more than what we could have expected. Location is EVERYTHING!!! There is no other way of saying it. You are there at the beach, pool, etc. Only steps from it. The sunrise and sunsets from the balconies where to die for. Ensure you have a camera ready at all times!!! The condo is what we military families need as hotels don't work right for big families in this type of setting. The condo was more than comfortable, all we needed and more. Each kid had their own room and bathroom so no shower fights or delays occurred :) each floor was spacious and well-equipped. Just buy your groceries and done! The rules of usage hanging at the main door were amazing. "Take your shoes off, fix yourself a drink, have fun... words to live by ahhhh." The resort was well-kept and well-maintained every day!!! The guards were great! Especially Mr. Ismael at our complex - what a great gentleman to talk to and very helpful with instructions and how to make our vacation a blast while at the property every day. The Palmanova Supermarket team - man! What a great store!!! - you pay a lil'bit more for the local convenience but is worth every penny - we have a fine taste for things and we never ran short of last minute items. It's well-stocked, affordable and plenty of available items. You don't need to leave the property and that was a BIG plus!!! The different amenities in the resort, i.e. the Beach Bohio team - what a great staff! Food and drinks were great! Jesus from the equestrian center and the horseback riding experience - what a BLAST! The Target Rental team and the golf cart experience - my kids and I felt like royalty with the cart. Believe it or not your social status is measured by the golf cart you drive not your car LoL!!! The overall experience was unforgettable and affordable. The nearby hotel team was also great - many events and the Iguana's were amazing!!! Take many photos but don't try to touch them. They are there to give you a nice warm feeling of the resort but respect their space ;) I could write a novel but it was Jorge, the owner who made it great for us with his attentions, information and constant care to ensure that we had a great time. Jorge, Hermano you da' man! It will be a time-share event for us!!! LTC Rodriguez & Fam. Situé sur la belle et calme au sud-est de la côte de Porto Rico (environ 45 minutes de l'aéroport. San Juan Int'l) au sein de l'exclusivité, tentaculaire Palmas del Mar Resort. Avec plus de 2 700 hectares et plus de 3, 5 miles de la plage bordée d'arbres de palme. Le complexe est situé sur la mer des Caraïbes, avec l'île de Vieques au Nord, Notheast. À distance de marche de toutes les commodités, y compris les épiceries, magasins, banques, restaurants, casino, et Shopping. De nombreuses attractions locales près de Palmas del Mar. Visite et marcher à travers la forêt tropicale notre enchantée: El Yunque - US Parc National, prendre des excursions vers les îles éloignées, des stations comme El Conquistador à Fajardo, ou visiter le quartier animé et la ville historique du Vieux San Juan, la capitale de Porto Rico, avec son architecture coloniale et forts vierges comme El Morro. Vous pouvez également visiter le plus grand centre commercial dans les Caraïbes, la Plaza de Las Americas, à environ 45 minutes.